Hey outdoor people of color! Have you ever found it difficult to talk to outdoor “friends” about certain issues? It's not a matter of distrust; the outdoor community is all about trusting total strangers with your life—even as you climb 80 feet off the ground. Yet, I can’t trust outdoor friends enough to be honest about my feelings on certain issues, such as sexual harassment, discrimination and inequality. So what makes an outdoor friend? My outdoor friends are fellow skydivers, hikers, or maybe the person cheering me on as I struggle with a challenging bouldering project. When I slip into my spot around the bonfire they are the people to my right and left. I trust them with my life. I enjoy their company. But there’s this dividing line of things we don’t talk about. After all, the social issues that weigh on me and affect my community are also the very things they come to the outdoors to ignore. They don’t come to the outdoors to talk about human rights, gender equality, immigration and sexual harassment. So it doesn’t matter how dehumanized I feel from the day’s latest headlines, my outdoor “friends”—who I trust my life, are silent on the issues that matter most. I find myself being hyper sensitive of what I post on my social media or what I say at the drop zone or at the crag because I fear what their response may be. I’ve heard so many times “let’s keep the good vibes going” or “I do such and such so I can escape politics” or “this is not the right time or place.” These people are my “friends” only to extent of what is comfortable and convenient for them and when it comes to issues beyond what we may see in our respective sports, they are silent. Even when it comes to issues within our sport that they don’t want to deal with, like sexual harassment, they are silent. Participation in outdoor adventure sports is changing. The makeup of our sports is shifting from majority white cisgender male participants to participants of varying genders, ethnic backgrounds, religions, and political views. With more diversity comes the necessity to both acknowledge and understand where different people are coming from. These are the first two steps in feeling empathy. Empathy is being aware of and being sensitive to the feelings, thoughts, and experience of another human being, without having fully experienced yourself. When hikers, climbers, skydivers say things such as “I don’t see color, let’s just climb” or “let’s just focus on the sport” they are rejecting the first step in empathy. They are unwilling to to acknowledge the existence of issues that don’t affect them personally. This rejection comes from a position of privilege. The ability to completely disengage and refuse to acknowledge an issue (like racism or sexism) that affects an entire population of people is a position of privilege. Indifference is actually difficult to achieve unless someone has constructed their life or their children's lives to maximize interactions and relationships with other people who look and experience the world in a similar way as them and minimize interactions with anyone who doesn’t fit this description. Is this your experience? Do you only hang out with other people who look like you? Are you a white cis man only hanging out with other white cis men and wondering why women and minorities complain so much about sexual harassment and pay discrimination when it’s not something you’ve ever experienced? Or maybe you’re not personally affected by family separation or police shootings of unarmed Black youth? So even if you’re intellectually opposed to racism it’s easy for you to set those issues aside for a weekend at the crag. Because it will never happen to you or your family. Such is life when you are part of the majority. But what about the rest of us? What about the increasingly diverse subset of women and minority climbers, skydivers, snowboarders, hikers, BASE jumpers, etc. If our community is to continue to thrive in the outdoors it is imperative that we take the steps to understand one another. Especially when our unity is vital to advocating for the conservation of the outdoor spaces we hold near and dear to our hearts. What do you do when your “friends” are silent on issues that affect you? As Kenny Hamlett pointed out, no one wants to be the “Angry Person of Color.” I personally have struggled with this, as I always want to keep the peace when it comes to my “friends” in skydiving, rock climbing. I want to be the skydiver, rock climber, fellow hiker, or coworker that gets along with everyone—that’s just my personality. And it’s practical in sports with high stakes where trust is so important. But that trust shouldn’t require silencing others. My nephews Raylen, Jayden and I at Coral Cliff Climbing Gym in Fort Lauderdale, Florida. Coming to terms with the fact that the majority of the people who I share my hobbies with do not look like me and will likely not think like me is difficult. However, I now understand that by remaining silent I am validating my “friends’” feelings that these issues are nonexistent. My goal is to speak up! Keep the conversation going. People may not like what I have to say, people may not want to hear what I have to say at all, but, by continuing to speak about issues that I find near and dear to my heart, I am giving them a voice in a world that may be indifferent. If there are “friends” who adamantly do not want to hear what I have to say with regards to social justice, civil rights, gender equality, etc. then they aren’t truly friends. They are just people I climb or hike or skydive with on the weekends. Friends and allies don’t have to have all the answers. The just need to be willing to listen. 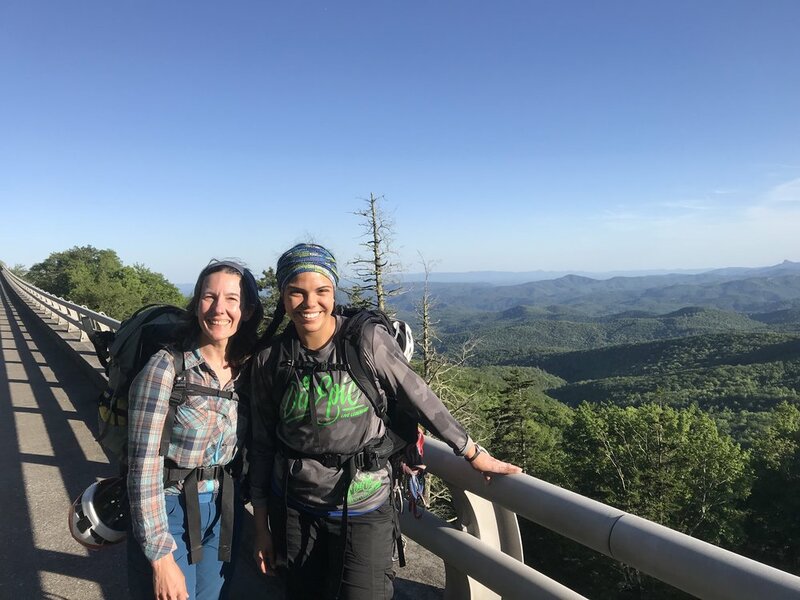 If you find yourself being “the only one” in your outdoor community surround yourself with allies who practice empathy—who don’t see you as the exception to a long list of stereotypes they have about women or queer folk or people of color. Ditch those “friends” who tell you you’re “not like other girls” or “I don’t think of you as Black.” Mental math and self restraint shouldn’t be required for you to fit into a world already categorized and sorted according to someone else’s prejudice. You should be able to speak your truth! My goal is to erase the stigma of being an African-American who is afraid of camping, or hiking, or swimming, and to change the narrative that white folks have about what black people do or don't do. Dawn Wall and Free Solo took up so much screen time, so much cultural space, that I am left feeling as though none of the work around diversity in the outdoor industry is ever going to pan out if we keep bolstering straight, cis-gendered, white men as demigods. Whenever I grew fatigued, the backhanded compliments kept me going. “You look so much better with straight hair!” and “when your hair is straight, you look so exotic!” were the most common. There was no way I could go back to feeling ugly, “too black” or less than. …I finally realized that my inner discomfort is rooted in a feeling of not-belonging. The problem is that we live in a society dominated by whiteness, and I will always be othered because I am not white. We need to cultivate a welcoming environment; to see other minorities thriving in order to set an example of acceptance. Being "the only one" is not enough. Individual stories of accomplishment are not enough. The outdoors do not always feel like a great place for a woman of color because of the other people who occupy, and in most cases have ownership of that space. The same people who claim there is no barrier are often the ones building the fence while denying they’re holding a hammer and nails. I sat alone on the side of the mountain nursing my pride and a torn ligament. To be fair I didn’t realize how serious the injury was at the time. And while I considered asking for help, I was too shy and embarrassed to admit that I needed it. Instead I thought back to what got me into skiing in the first place. They’ll tell me how beautiful my land is, how strong the people are—the incredible generosity of the incredibly poor. They’ll ask me if I’ve ever been to my homeland without ever knowing the deep, inter-generational heartbreak of that question.